The 188 young missionaries in the Australia Melbourne Mission came to a special conference with Elder Neil L. Andersen of the Quorum of the Twelve Apostles with a question in their heart. 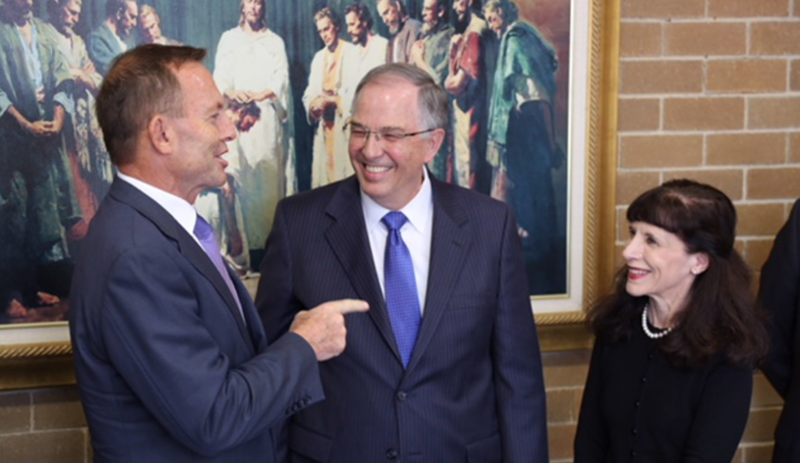 Imagine the surprise when Elder Andersen walked in to the March 16 meeting with Honorable Tony Abbott MP — the former prime minister of Australia. The former prime minister’s visit came at the invitation of Elder Andersen, who traveled to the country with his wife, Sister Kathy Andersen, and Elder L. Whitney Clayton of the Presidency of the Seventy and his wife, Sister Kathy Clayton.